I remember the first George Foreman grills years and years ago. Remember “Knock Out the Fat!”?. George has come a long way and is now offering the same fat reducing cooking now with added versatility. If your kitchen is like mine, you don’t have the room to house 4-6 individual appliances. The George Foreman Evolve grill gives total countertop versatility plus healthy cooking. 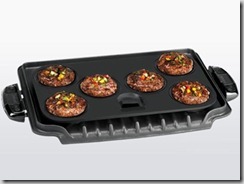 This particular set comes with 4 plates: 2 grill, 1 deep-dish bake pan and 1 mini burger insert. There are up to 10 plates available to purchase to expand the versatility… you can use your Evolve grill for every meal! The old slope on the first grill has been upgraded with an adjustable slope that lets you lay the surface flat for even cooking or use the slope to help “knock out the fat” as you grill. Have you seen how much fat you can drain from a burger? Let’s just say…. eeeeew. I’ve always loved how easy the George Foreman grills are to clean. The Evolve grill is no exception. The nonstick coating lets you cook without added calories from oil or butter, even on delicate foods. The size is perfect for a family of 4 sporting an 84 square inch cooking surface. George has added a digital timer and temperature control to the panel so you can get perfect results every time. Did I mention dishwasher-safe removable plates and accessories? You can grill all your favorites for every mean. 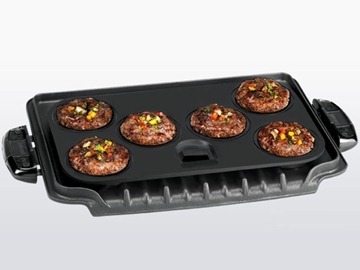 Use the bake pan for casseroles, omelets, lasagna and even prepackaged brownies, then switch to the mini burger insert for up to 6 mini-burgers or sliders for your next party, tailgate or pot luck or use the grill for sandwiches, grilled steak and poultry. I especially like that it doesn’t heat up the entire house… making it perfect for summer use. We tend to not turn the stovetop or oven on as our house has a difficult time cooling down in the middle of the day. We have a few meat eaters left in the family, and if they want a slider for lunch they can have it with no complaints from mom. I might even toss a sandwich on the plates before their turn for a quick meal for mom or the little ones. Versatility is key in a mixed house (vegetarians & meat eaters)! The George Foreman Evolve Grill the perfect grill for anyone looking to expand their healthy cooking menu without cluttering counters with a lot of extra appliances. 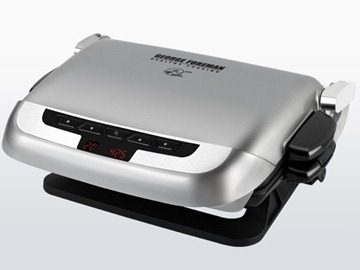 ONE OurKidsMom reader is going to win a George Foreman Evolve Grill! * Visit George Foreman’s website and tell me something you like or learned. You do not have to be a blogger to enter/win. An email address is required to enter. The winner will be chosen via the WordPress plugin “and the winner is…” and contacted via email. A reply to the winning email is required within 48 hours before a new winner is chosen. One person entering per household please. U.S. only. This giveaway ends at 11:59PM EST on July 6, 2011. I visited the GF website and I just love the versatility of this grill and how easy it is to change the plates! I ‘liked’ George Foreman Cooking on Facebook! I visited the george foreman grill and learned that ground turkey can be more unhealthy than ground beef. Surprising! I like the Champ Grill GR10B! This would be perfect for my hamburgers! I like the Indoor/Outdoor Domed Grill. I follow OurKidsMom via Google Friend Connect. (1) I “Like” George Foreman Cooking on Facebook as Gaye M.
(2) I “Like” George Foreman Cooking on Facebook as Gaye M.
I entered your Epson Giveaway. I really like that the George Foreman grill removes 42 percent of fat. That is really awesome. Let’s just say that I’m old enough to remember the original George Foreman grill. Very well designed.. and definitely cut the fat. 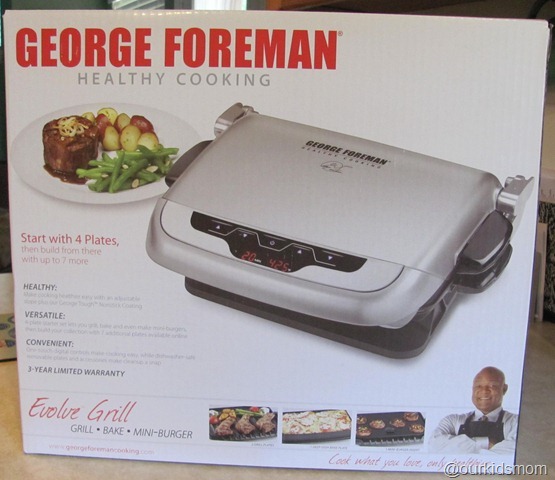 Now, I very surprised the number of products offered under the George Foreman brands. I love it. I also like the Indoor/Outdoor Domed Grill! I would like the George Foreman Champ grill. I like the George Foreman Champ grill. i learned that it has diffrent plates for diffrent cooking idea. my george forman grill is one of the originals so no plate changes. I like the indoor/outdoor domed grill. Thanks for the contest. I love that you can put the inserts into the dishwasher, & I didnt know they also sell Countertop ovens. I learned that every George Foreman grill is set at an optimal angle that allows fat to drain away as you cook—without drying out your food. LOVE THE 360 GRILL heck i love his stuff and have worn out some of his grills- hoping this is my new one! I like the 360 grill. I also like the Panini Grill. I like the 360 Grill from George Foreman too! It seems that everything about the grill is based on ease. I love the way to clean, the interchangeable parts, and the variety of items I can cook. A real time and space saver! I learned that George Foreman was a boxer in the day. Over 100 million grills sold worldwide. Like” OurKidsMom on Facebook #1. Like” OurKidsMom on Facebook #2. Entered your Logitech’s COLOR COLLECTION: Wireless Mouse/Keyboard, Lapdesk & Webcam giveaway. On their website, I loved their recipe for “Breakfast in Bed for Mom”! I’m going to pass that along to my family! I Follow OurKidsMom via Google Friend Connect as ParentingAuthor. I “Like” OurKidsMom on Facebook. #1 I “Like” George Foreman Cooking on Facebook. #2 I “Like” George Foreman Cooking on Facebook. I Subscribe to OurKidsMom’s RSS feed by Google Reader. I entered the Field of Vision giveaway. I entered the Epson scanner giveaway! I learned George Foreman grills come with dishwasher-safe accessories and removable plates. What I like is George Foreman and his commitment to better health- he has been at it for a long time- he even has workout videos! I learned that results of independent testing show that the George Foreman Grill removes up to 42 percent of fat from quarter-pound burgers made with 80/20 ground chuck beef. I would love to have the panini grill. I “Like” Foreman Grills on Facebook. I suscribe via google reader. LOVE that they have lots of recipes to try. i love the plates are removable and dishwasher safe!! I also really like the Smart Kitchen™ Multicooker! The plates are removable and dishwasher safe. Thanks. I learned that they have lots of recipes to try. i LOVE that you can throw it in the dishwasher, if i don’t win i think i might go buy it. 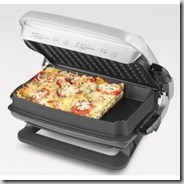 I learned about the George Foreman Evolve Grill that makes Waffles! Pricey at $129.99. Wish I could afford one. Hope to win! I “Like” OurKidsMom on Facebook on Facebook! Love the Smart Kitchen Multicooker. I would love to have the multi cooker from foreman. Entered your Rubbermaid 8 pc Glass Set with Easy Find Lids giveaway. I like the 360 grill in red! I like george foreman cooking on facebook! I learned that flavor and grease are not the smae. I learned that grease and flavor are not the same thing! The George Foreman grill reduces up to 42 per cent of the fat. wow I learned that George can knock out up to 42% of fat!! I’m in! I’d love to have the Smart Kitchen Multicooker. 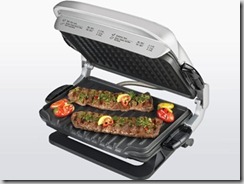 I like the Evolve™ Grill – Waffle from George Foreman! 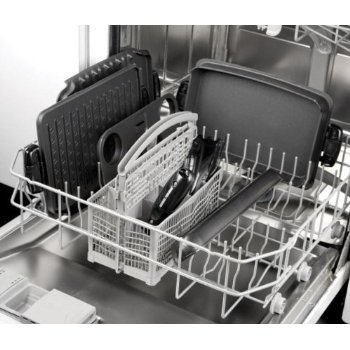 The product highlighted in this post is good too– I love these multi-use appliances! wow, this one puts my foreman to shame! I love how versatile foreman grills were, I didn’t know the full extent of the capabilities until viewing the website! You can get $25 off if you purchase a G5-Grill on July 4th. Mandatory: I like that there are additional plates for the grill. The offer free ground shipping on orders over $99. I also like the George Foreman Indoor/Outdoor Domed Grill. Thanks! Last comment was #1. Sorry about that! Would also love the Multicooker. Love the extra plates that you get with the set, and the ones you can buy seperate. i love all the accessories & that it’s diswahser safe! I like the Panini Grill. I remember nr of the first times I saw George Forman promoting his grill. he was a natural and he ate the food with gusto. What a charmer. Saltonwas brilliant to use him as their representative. I love that it reduces fat by up to 42%! I like the Countertop Oven & Rotisserie. Another product I like is the Smart Kitchen Multicooker. Wow, the George Forman really has evolved. I have two, one small one large. Neither of them are dishwasher safe which I learned this one does and all the interchangable plates are great. I also learned you can get a waffle, omelet, muffin and griddle plate and a Consumers Digest Best Buy too. Thanks for a great giveaway! i learned that there are 11 different kinds of plates for the evolve grill. George Foreman Grills knock out up to 42 per cent of the fat. I also really like the 360 grill! We have a small outdoor grill (small because we needed something that we could bring inside to clean) but here in the Northwest the weather is often not good for grilling outside, so this looks like a great alternative. I entered the BioBubble giveaway. I entered the Sportcraft giveaway. I like that the George Foreman grill removes up to 42% fat! I like George Foreman Cooking on facebook. I subscribe via email 1. I subscribe via email 2. I entered your Logitech giveaway. I found a recipe for Soy Grilled Salmon. Sounds delicious, and it seems I have a new resource for creative recipes! Thanks! I like you on facebook: Chanelle L.
I learned that, as a vegetarian, I too could use their grills! I found a recipe on their site for Grilled Bananas that looks too good to imagine!!!! You can also grill fruits. I was surprised to see that the grill can remove 42 % of fat. Wow! I would like to have the Smart Kitchen™ Multicooker. I also like the Skillite Searning Skillet. Liked George Foreman on Facebook as Audra Lynn W.
I like OurKidsMom on facebook! I like George Foreman’s Cooking on Facebook! I follow OurKidsMom via Google Friend Connect! I subscribe to OurKidsMom through email! I’m also entered in your Kranky Krab $15 GC giveaway! I like the Panini Grill. 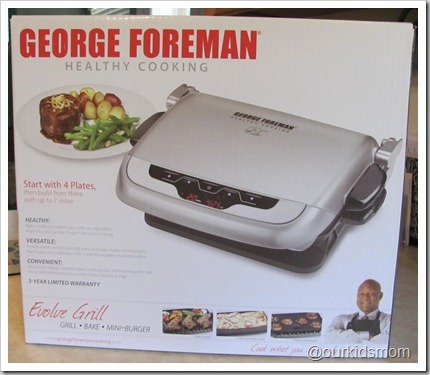 We have been wanting one and I didn’t know George Foreman made one! Thanks! I entered the OH Sew Lucky! giveaway. I entered the Step2 giveaway. he had lost it to Muhammad Ali. I love the 360 Grill – Black! I LOVE the fact that they sell easy to clean grills…I hate cleaning my old George Foreman! I really like the interchangeable plates & that you can just throw them in the dishwasher. Very convenient! Designed to knock out the fat when you grill – up to 42% of fat – wow! love that the grill is designed to fit thicker food and drains the fat right off! genius! follow george foreman cooking on fb!